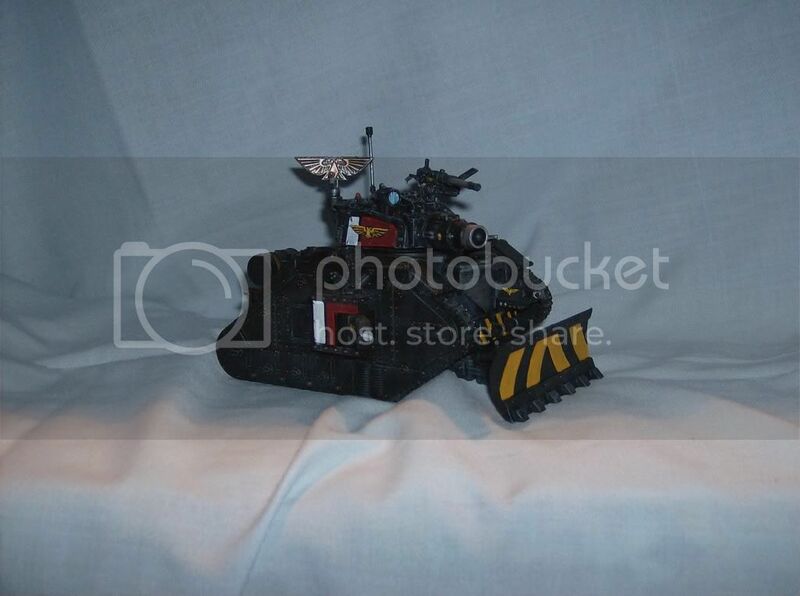 My command bunch w/ Macharius, HSO (converted RT Marneus Calgar), HSO's tea table (Trademark item... I've always wanted the general to be some extremely arrogant guy who just sits far away from the battle sipping his tea! 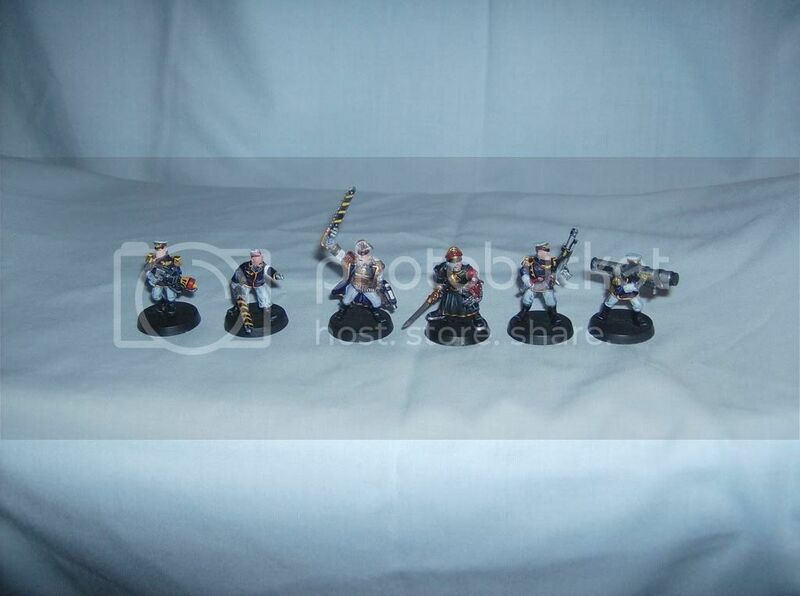 ), Senior Officer, Commissar, Standard Bearer, Plasmagunner, Medic, Plasma Pistoler. 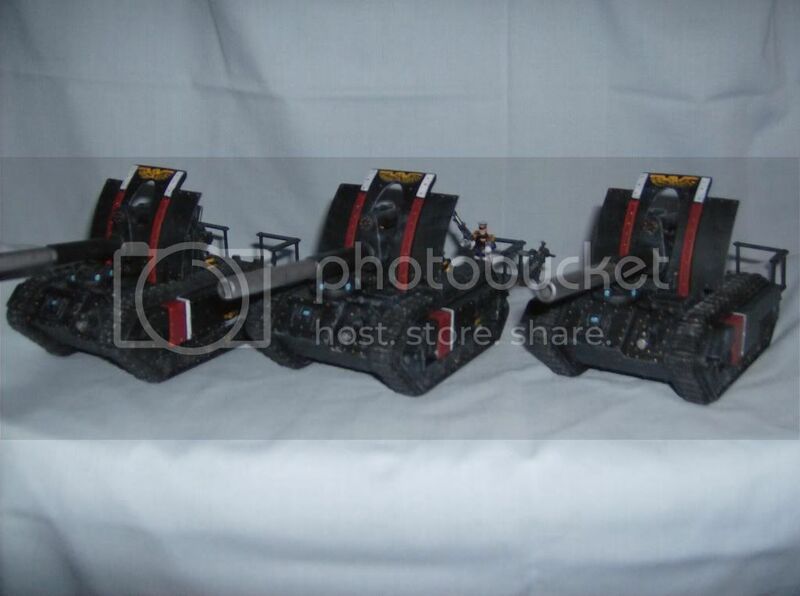 Heavy weapons, 2 lascannons, 2 missle launchers, 2 autocannons, and a heavy bolter. I'll post the rest later... my laptop's running out of battery power . Well that's it! Questions, comments, concerns... anything is appreciated! PS, sorry if a few of these are a little blurry! 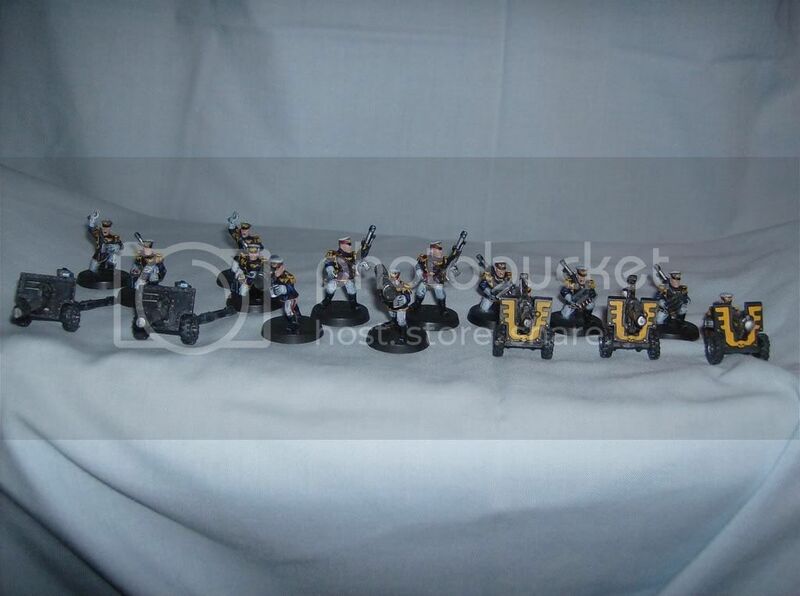 I like it too, it is nice to see a themed army that someone has put so much work in to. 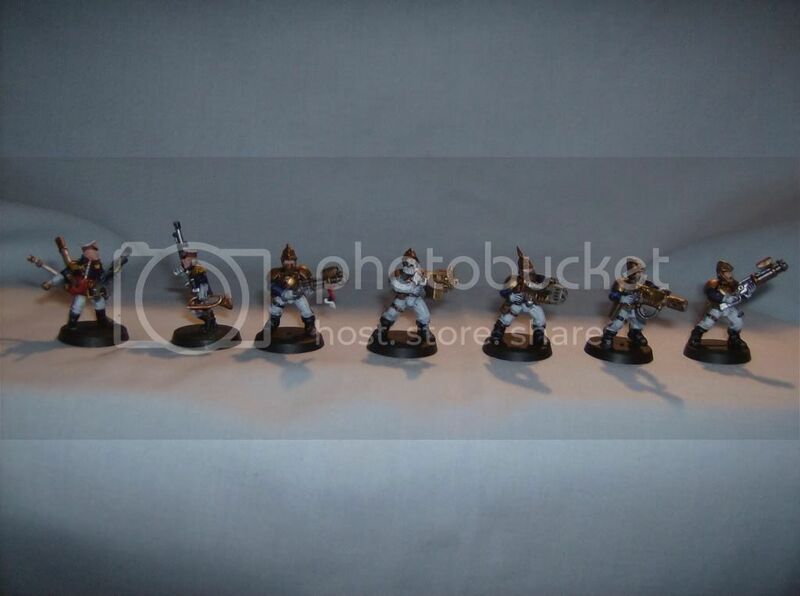 Do you think I should base my infantry? And if so, how? Yes and city street theme. Also on your vehicles the reds seem a bit transparent, IMHO a deeper red would look a bit better. Awesome army though. 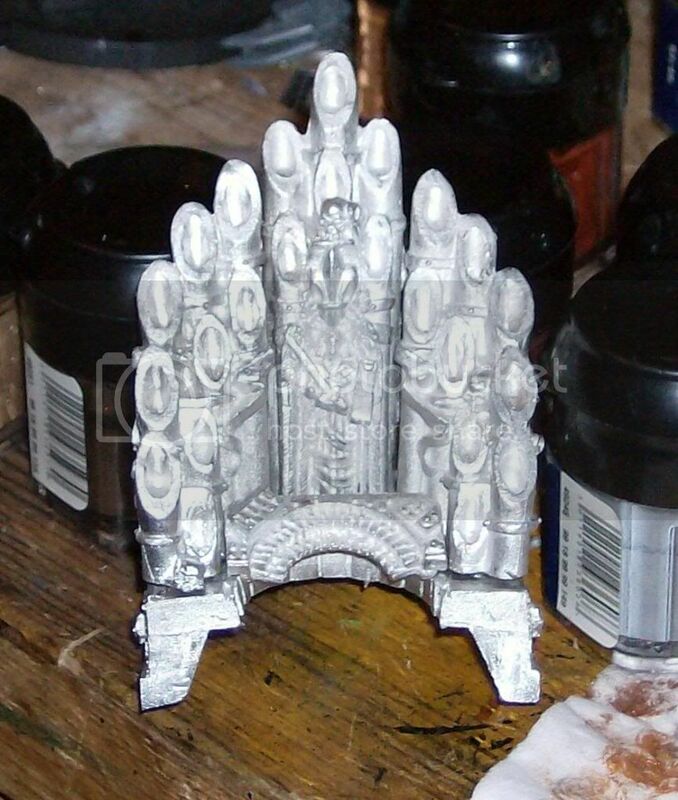 I'm loving the tea table and it's use in your army. Great job! i agree with the urban scheme for bases, it will really suit these guys. 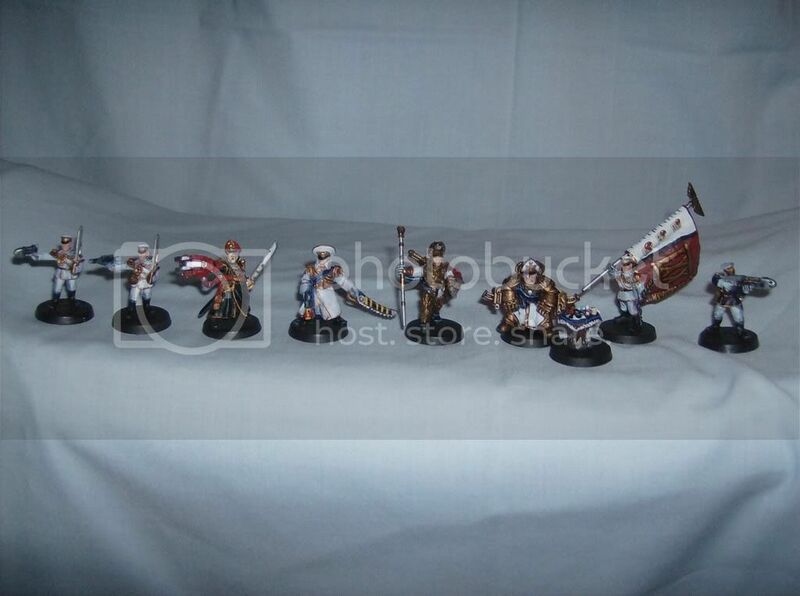 i have a tutorial on here to paint rubble, but it can be used for painting sand on bases aswell. Thanks for all the feedback! I appreciate it. Anyway, I want to make stormtroopers for these guys now, and I figured I'd make them similar to the Chiros Red Guard from the Macharian Crusade PDF from BOLS. So how would you suggest I make them more stormtroopery? I'll need to make their guns more hellgunish, but I'm sure there are other things I could do as well. If you could give me any ideas, it would be nice. 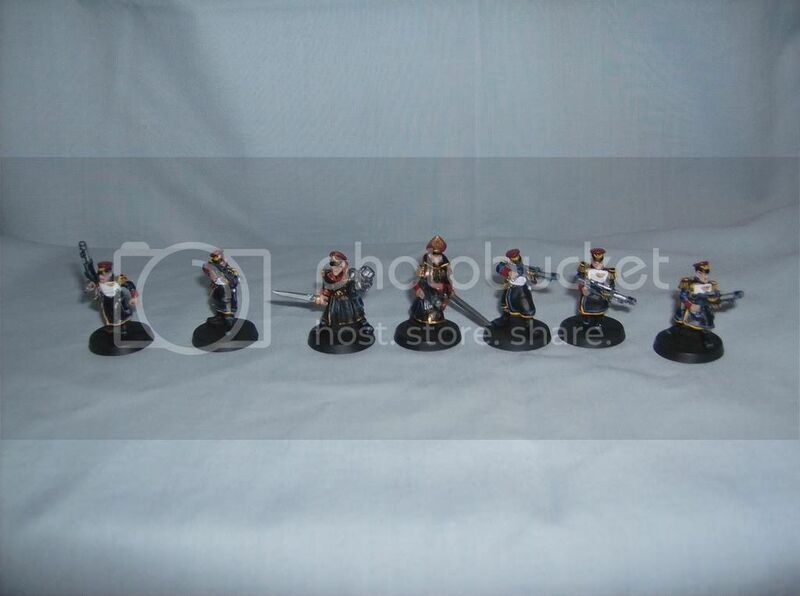 Also, I just got in all the mordians I ordered, so expect to see a couple more pics sometime in the near future. This topic seems kind of dead... but it's in my signature, so doggone it, I'm gonna keep it updated! 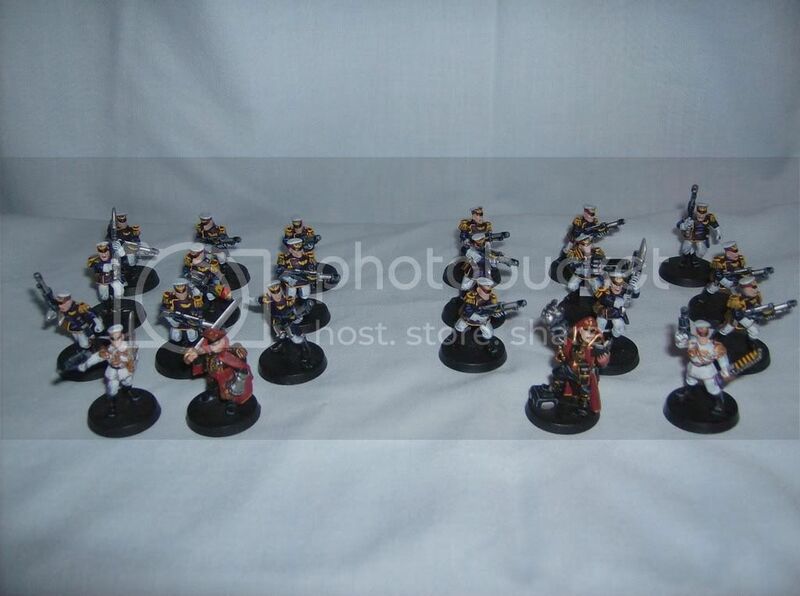 Anyway, It seems that the near future turned out to be over a month, but here are my stormtroopers! Here's a bit more of a close up on a few of them, as well as my first trumpeter and my bagpipe player. I didn't have a picture of bagpipes in front of me when I made them though (which was probably a mistake! 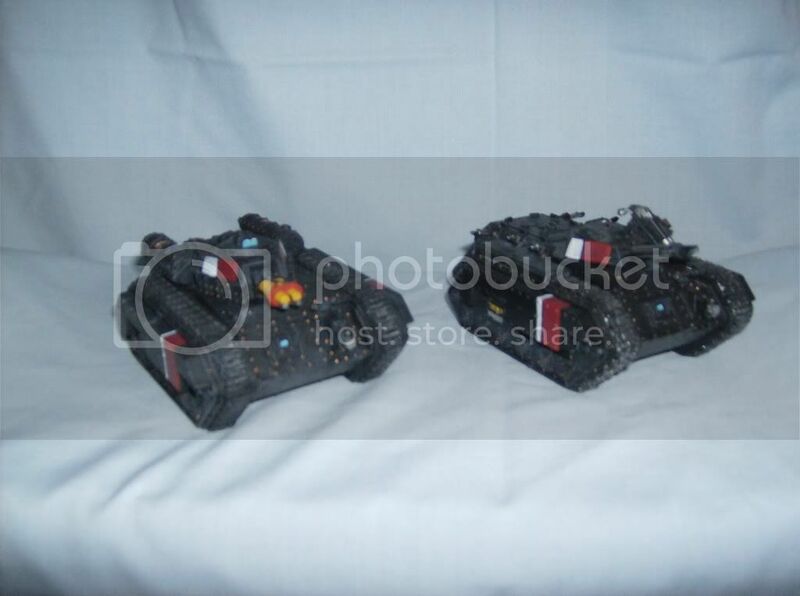 ), so I had to rely on memory to make them at least resemble what I wanted them to look like. 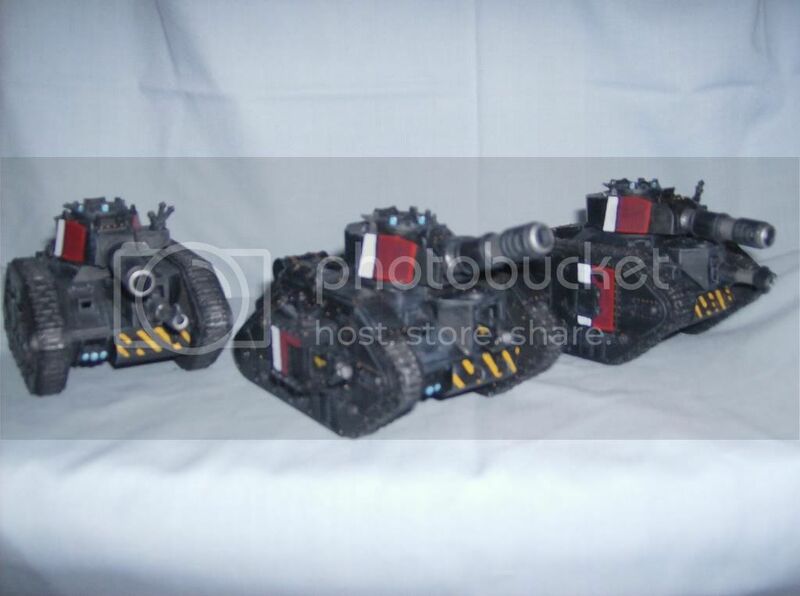 Finally, here's my Leman Russ Conqueror, now repainted to join my Mordians! Also, I see what you mean about the red being a little transparent... I might need to fix that sometime. 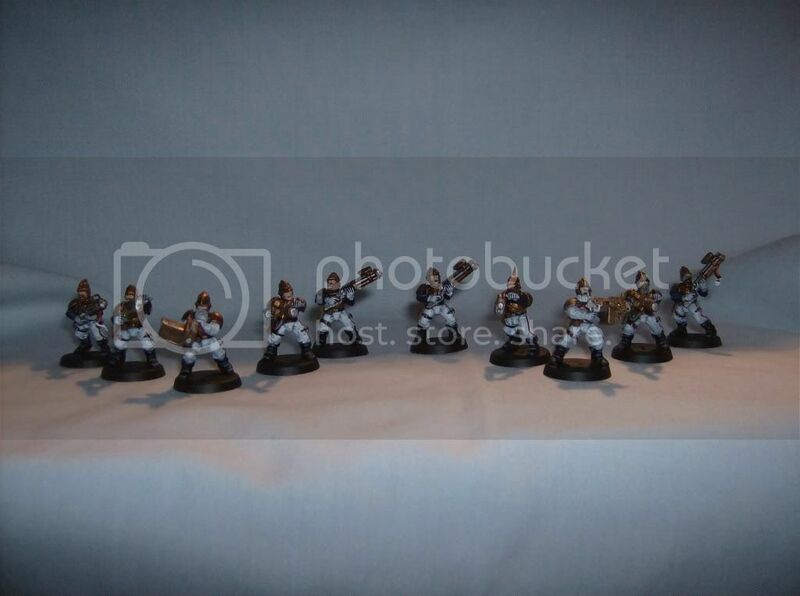 I just primed another 4 lascannon teams today, so I'll probably post a picture of my 2 lascannon support squads when I'm finished painting them. Anyway, thanks for looking, and feedback is always appreciated!